As many of you may have noticed, deliveries of the popular Short Tripod that we sell have been few and far between recently. One positive move that has come from this, however, is that Ray has now worked with British blacksmith and long-time friend of Woodlore’s, Andrew Kirkham, to design their very own take on the bushcraft cooking tripod. 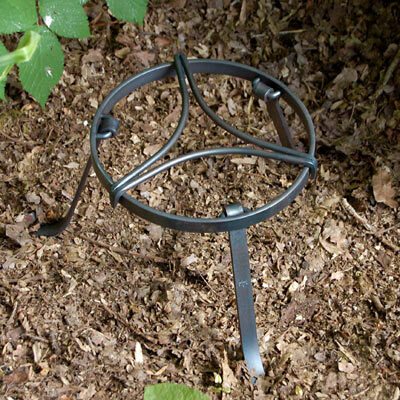 The Ray Mears Folding Trivet is a tough, fully-collabsible cooking tripod, ideal for bushcraft use. Hand-made from mild steel, this is a piece of kit that will see it through many trips and adventures. 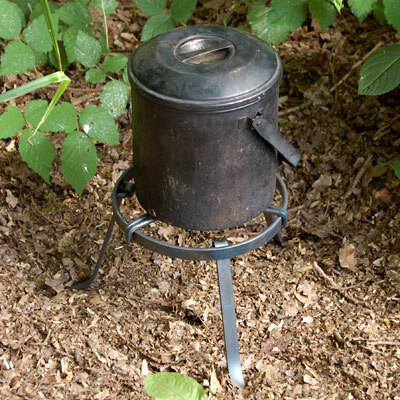 Unlike standard cooking tripods, it features a unique, removable pot stand which, when placed over the cooking platform, makes it possible to cook with smaller pots and mugs such as the Zebra Billy Can or Military Crusader Cup, making it perfect for Bushcraft use. This entry was posted in Bushcraft Clothing & Equipment on July 9, 2010 by Woodlore Team. Excellent. Good news that it can now take a Zebra billy.